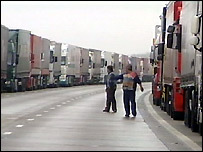 Lorries are being parked along the M20 in Kent because of on-going industrial action by SeaFrance workers in France. Police have implemented Operation Stack to ease traffic backlog caused by the strike at the Port of Dover. Junctions 8 to 9, between Leeds Castle and Ashford, of the coastbound section of the M20 have been closed to traffic. The road has already been closed for seven days due to the strike and bad weather, the longest use of Operation Stack since its launch 20 years ago. A Kent Police spokesperson said: "This may need to be in place permanently until the industrial dispute is resolved, although there are contingency plans to enable Stack to be stood down if there isn't a need to have it running." The carriageway is used to park freight traffic destined for France before directing them through to the Channel Tunnel or ferries at Dover as space becomes available. Non-commercial traffic heading for Dover, Folkestone and Eurotunnel is being advised to use the A2 and M2 diversions to avoid delays. Other traffic is diverted from the motorway at junction 8 onto the A20. The strike by SeaFrance workers has now entered its 13th day.